Similarly to Taipei and Singapore, Hong Kong made a good impression on us. Actually a great one. A busy modern city with all the western comforts, functional public transportation system, eastern culture and sights, vicinity of nature and chinese food is always a winner for us! We dedicated 10 days of our last month to this city. At first we thought this will be too much time, but then realised that Hong Kong is a huge place. It consists of four main parts: Honk Kong island, Kawloon, New Territories and Outlying islands, all four with many things to do ranging from sightseeing to hiking and enjoying time at the beach. Moreover, we were staying with our old friend / neighbour from our Bahrain days, Kayo, so our time was pretty nicely filled. Hong Kong was set up by the British as an important trading port. Until just recently the city was the No. 1 port of the world. It is still in top 10 and on the way from the airport to the centre you can see the billions of dollars of goods stacked in the containers waiting to be loaded. It is an impressive view when you reliase it is not thousands of lego pieces that spread underneath. In 1997 the prosperous country was handed back to Chinese and is now operated under ‘one country, two systems’ rule which somewhat gives it an autonomy, even though the Chinese are increasing pressure resulting in e.g. censorship or forcing locals to speak Mandarin (language of HK is next to commonly spoken English Cantonese). There is a lot of people living in Hong Kong. In result the space is precious here. The buildings rise high rather than wide and the expensive flats are often squeezed into hobbit proportions. When you walk to the metro you are very likely to bump into other pedestrians because of the heavy traffic and practically no rules on which side of the pavement to walk on. We found Hong Kongers quite selfish in this perspective. Also every single person has a smart phone and every other one uses it while walking. Collision is inevitable. When it rains, protect your eyeballs from umbrellas (due to the average height they are in the same level). Luckily it did not rain much and so our eyes stayed preserved for some sightseeing. We started our ‘tour’ with the History Museum. We highly recommend it as it paints a nice picture about the history and culture of the country before you go out to explore. Make sure to watch the video shows too. Later in the week, on Wednesday – when all museums are free – we also went to the neighboring Science museum. Although it was packed with kids, we liked the interactive displays and logical games very much. From the TST metro station it is a short walk to the Avenue of Stars. Besides the concrete imprints of famous Asian stars and a statue of Bruce Lee, we enjoyed the view of the main island of Hong Kong (Hong Kong island) with its sillhouette of skyscrapers. From here we took the famous Star Ferry back to Wan Chai where we stayed in Kayo’s flat (also on the HK island). One of the top attractions of Hong Kong is The Peak and the tram that takes you up there. It is basically a mountain on the HK island and it offers pretty spectacular views over the city. Other than enjoying the view, you can visit a museum, indulge in shopping and – our choice – hike around or back down into the city. On our way down after what seemed like a path in a jungle we reached the top of Mid-level escalator. This rarity is the worlds longest covered system of escalators that makes is easier for HK-ers to climb up and down their hilly city. In the morning hours the escalator operates downwards towards the metro and afterwards it switches to move people up the hills. The second time we got a chance to enjoy some nature was with Kayo and her friend Nis. They took us to the Lantau island for a small hike through the forest. At the end of the spider filled trail there is a small dam that strongly resembles a 5 star hotel infinity pool with a few differences. There is no service to fill up your pinacoladas and while enjoying a refreshing dip you are surrounded by nothing but tropical greenery. After you enjoyed the view a fresh shower is available up the stream under a waterfall. Amazing and highly recommended! We got here fairly early and so managed to avoid crowds. We managed to squeeze in some beach time during our stay too. 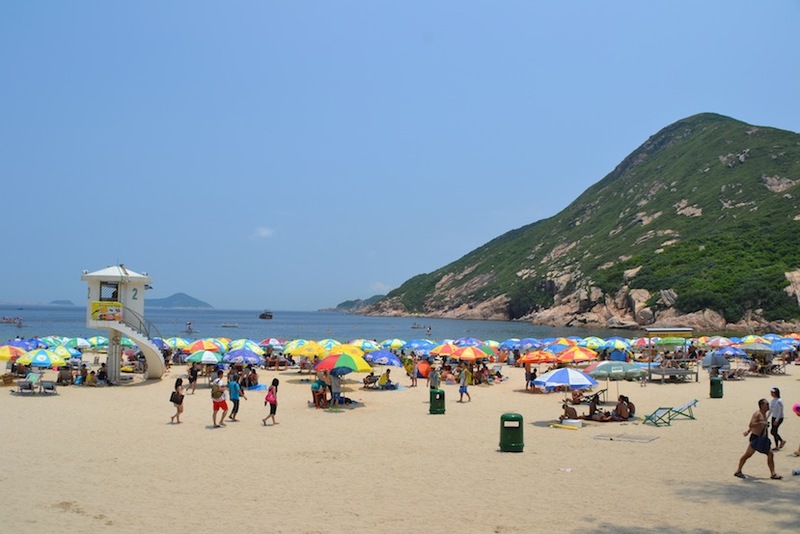 We were recommended Shek O beach, a small, busy beach in the south of the HK island. The bus ride here is a thrilling experience itself and the beach is fun for people watching and having a bbq with a group of friends. 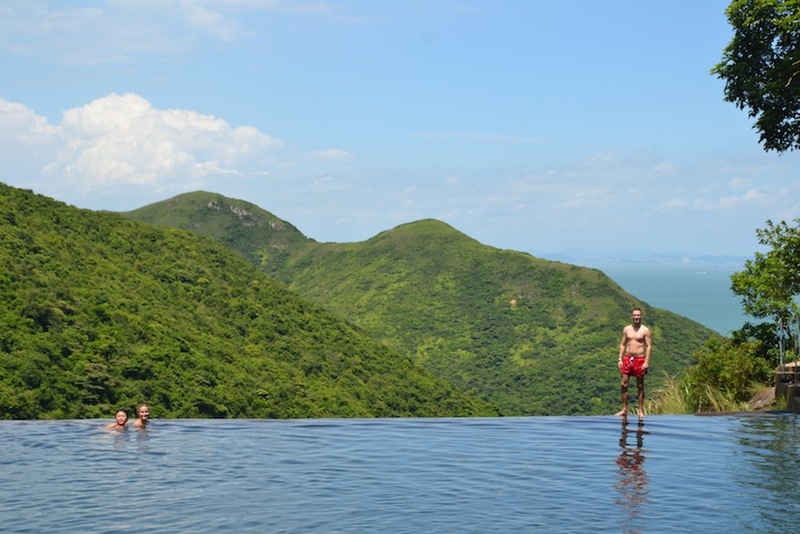 We did some more swimming on Sunday, our last day in HK. Kayo invited us and other 25 friends for her birthday celebration on a junk boat. We spent the day having drinks, eating from a delicious buffet and swimming around. As we had enough time to explore we also got a chance to visit the New Territories. We picked Lonely Planet’s Ping Shan heritage trail that took us through what is left of traditional walled village. The pictures will tell more. 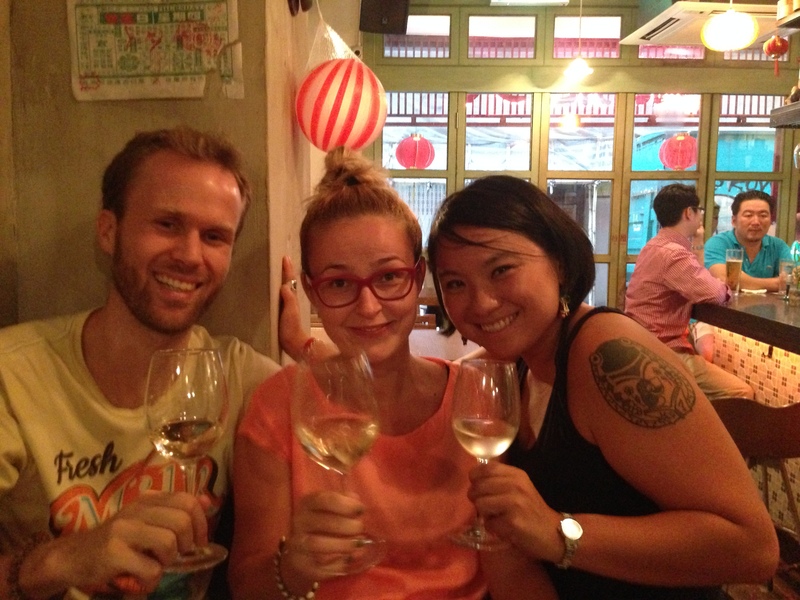 There was one main thing we were excited to do in Hong Kong. It was to eat! If you remember our post about Chinese cuisine you will know why. Thanks, Kayo, for having us over, introducing us to your friends and showing us your city as well as your nice school! Tak ako Taipei alebo Singapore, Hong Kong na nas urobil dobry dojem. Velmi dobry! Moderne mesto s komfortom zapadu, spolahlivou MHD, vychodnou kulturou a pamiatkami a cinskou kuchynou u nas vzdy vyhrava! Na navstevu Hong Kongu sme si vyhradili 10 dni. Spociatku sme si mysleli, ze to mozno bude az prilis vela casu, ale potom sme zistili, ze Hong Kong nie je len mesto. Jeho uzemie sa sklada zo styroch hlavnych casti: ostrov Hong Kong, Kawloon, Nove Teritoria a okolite ostrovy. Kazda cast ponuka mnozstvo aktivit vratane pamiatok, turistiky a plazi. Navyse sme byvali u nasej starej znamej, susedky z Bahrajnu, Kayo, takze o vyplnenie nasho casu bolo postarane. Hong Kong postavili Briti ako dolezity obchodny pristav. Donedavna bol cislom jedna v svetovom rebricku pristavov a dnes je stale v top 10. Uz cestou z letiska sme mali moznost vidiet miliardy dolarov vo forme tovaru v kontajneroch naskladanych na seba kam oko dovidi, cakajuc na nalozenie. Pohlad je to fakt paradny ked si uvedomite, co v skutocnosti je tento obrazok pripominajuci tisicky lego kociek. V roku 1997 bol prosperujuci HK navrateny Cine a momentalne funguje v akejsi autonomnej forme, ktoru cinania nazyvaju ‘jedna krajina, dva systemy’. Tlak Ciny je ale podla domacich poznat vo forme ciastocnej cenzury a napriklad tiez povinnosti ucit sa mandarinsky (v Hong Kongu sa hovori kantonsky). V Hong Kongu zije vela ludi a tak sa tu priestor velmi vysoko ceni. Budovy siahaju do vysok namiesto sirok a predrazene byty su scvrknute do hobitich velkosti. V dosledku husteho zaludnenia a neexistujucich pravidiel pre chodcov mate cestou na metro velku sancu sa s niekym zrazit. Hongkongcania sa nam zdali byt celkom sebecki v tomto ohlade. Navyse kazdy jeden okoloiduci je zahladeny do svojho smartfounu a tak nema sancu vidiet pred seba. Zrazka sa stava nevyhnutnou. A ked prsi, ochrana oci pred dazdnikmi je dolezita (kvoli relativne malej priemernej vyske su ich dazdniky a nase oci v jednom leveli). Vdakabohu neprsalo moc a tak nam ostal zrak pre pamiatky a zaujimavosti mesta a okolia. Prehliadku sme zacali v historickom muzeu. Navstevu odporucame naplanovat na zaciatok pobytu, kedze muzeum pomoze vytvorit si obrazok o dejinach a kulture toho, co uvidite neskor. Nenechajte si ujst pocetne videa. O par dni neskor – v stredu, ked su muzea zdarma – sme navstivili aj susediace vedecke muzeum. Sice bolo plne prazdninujucich deti, my sme sa ale vysantili pri interaktivnych displejoch a logickych hrach. Zo stanice metra TST je to kratka prechadzka k Avenue of Stars (avenue hviezd). Okrem betonovych otlackov znamych azijskych hviezd a sochy Bruce Lee, je odtialto pekny pohlad na siluetu mrakodrapov na ostrove HK. Naspat na ostrov sme sa odviezli lodou Star Ferry, ktora je v HK velmi znamou atrakciou hlavne vdaka jej dlhorocnej historii. Vystupili sme priamo v stvrti Wan Chai, kde sme byvali v byte kamosky Kayo. Jedna z top atrakcii Hong Kongu je The Peak, alebo Vrchol, a zubackova tramvaj, ktora sem navstevnikov vyvaza. Z Vrcholu je paradny pohlad na mesto. Okrem vyhladu tu je aj muzeum, nakupne centrum a niekolko chodnikov po tropickom lese, ktory pokryva nezastavane uzemia Hong Kongu. Na navrat do mesta sme si zvolili prechadzku prirodou, ktora nas doviedla do betonovej dzungle a to priamo k miestu, kde konci tzv. Mid-level eskalator. Tato rarita je najdlhsim zakrytym systemom eskalatorov na svete a pomaha hongkongcanom zdolavat kopcovoty teren mesta pri ceste do a z roboty. Rano sa schody pohybuju smerom dole k metru a potom sa automaticky prepinaju a vyvazaju ludi zas naspat hore. Druhykrat sme si uzili tunajsiu prirodu ked nas vzali Kayo a jej kamarat Nis na sobotny vylet. Na ostrove Lantau sme sa vydali na kratku turistiku do lesov. Na kocni chodnika lemovaneho ohromnymi pavukmi je mala priehrada, ktora pripomina obrazky pathviezdickovych hotelovych bazenov s vodou, ktora preteka cez okraj. Rozdiel je, ze nam tu nikto nedolieval koktejly a nasim vyhladom bola sama zelen a more pod nami. Po okupani sme si dali osviezujucu sprchu pod vodopadom, co viac mozeme chciet! Doporucujeme sem prist skoro rano a tak sa vyhnut davom. Do programu sa nam podarilo vlozit aj nejaku tu plaz. Navstivili sme Shek O beach, ktoru nam doporucila Kayo. Cesta autobusom je dobrodruzstvo samo o sebe a mala rusna plaz je dobrym miestom na okukovanie davu ci barbeque s kamaratmi. Viac plavania sme si uzili az v nedelu, v nas posledny den, kedy nas Kayo pozvala na jej narodeninovy vylet lodou. S dohromady 25 ludmi sme stravili den popijanim, cvachtanim sa a na obed bol pripraveny bufet priamo na palube. Kedze sme mali na preskumanie Hong Kongu dost casu, mali sme moznost navstivit aj oblast Novych Teritorii. Vybrali sme si naucno-historicky chodnik Ping Shan zo sprievodca Lonely Planet, ktory nas viedol po zostatkov tradicnej dediny s ochrannymi murmi. Obrazky vam ale povedia viac. Na jednu vec sme sa v Hong Kongu tesili asi najviac. Jedlo. Ak si pamatate nas blog o cinskej kuchyni tak isto viete preco. Diky, Kayo, za to, ze si nas prichylila, zoznamila nas s kamaratmi a ukazala nam tvoje mesto aj tvoju paradnu skolu! no konecne mam zase co citat!